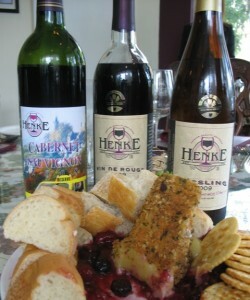 It’s Day 101 of “365 Things to do in Cincinnati” and today we are featuring the wonderful Henke Winery. Henke Winery is a unique urban winery and restaurant located in the west side of Cincinnati. 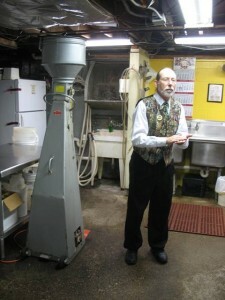 Owner (and wine maker) Joe Henke started the business in 1996 and hasn’t looked back. The Henke Winery is an award winning winery paired with a fantastic restaurant where all of the food is created to compliment the wine. For our visit we enjoyed a wonderful wine tasting. The first wine was Henke’s 2010 Award Winning “Vin de Rouge”, a red wine. Let me tell you folks – if you’re not a red wine lover BEFORE you drink this wine you will be afterwards! This was, far and away, the best red wine I’ve ever had (and at just $10 a bottle when you buy it to go, you better believe I left with multiples!). I then sampled a Riesling and Cellar Blush which were all outstanding. I would highly recommend their wine tastings – just $5 for 7 wines! How can you go wrong with that?! I got to sit down and enjoy our wine and appetizer (pan seared cheese with a fantastic cheery wine sauce) with owner Joe Henke and Chef Scott. These are two of the nicest men… and so very passionate about what they do! Henke Winery produces about 1700 cases of wine per year. The wine is all made onsite right there under the restaurant. 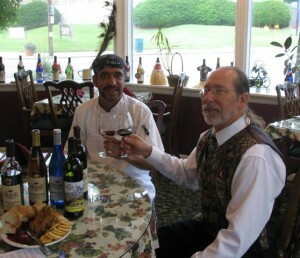 Their wine is sold at the winery/restaurant (of course) as well as in other restaurants and select stores all over Ohio. They’ve won many awards for their wines, including Best of Show (Vin de Rouge) and Gold, Silver and Bronze in the Ohio Wine Competition 2010. After our wine tasting we got to take a tour of the wine making area (I’m sure there’s a better name for it than that but you know what I mean 🙂 ). The wine is all made in the late summer and early fall, when the grapes are at their peak. Henke wines are all bottled by volunteers, about 70 of them actually. The wine in made and bottled here onsite, with each bottle being labeled by hand! When you’re talking to Joe, it becomes immediately apparent that he LOVES what he does. He was the most gracious host. He told us all the in’s and out’s of making great wine. Did you know that some wine is stored in oak barrels (as seen above) and some is stored in stainless barrels? 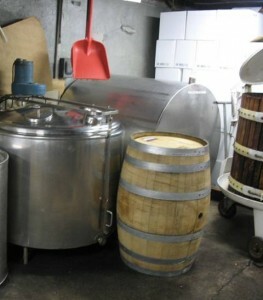 It all depends on the variety of the wine; some wines benefit from the oak container and some taste better without any essence of oak (hence the need for stainless containers). You’ll see Joe Henke in his glory in the picture above 🙂 Joe Henke will take you on a tour of the wine making facility if they aren’t too busy – just ask. I certainly don’t want to neglect the restaurant here because the food is just as good as the wine! They have a huge menu with everything from Strip Steaks to Fresh Atlantic Salmon to pizza and pasta. Enjoy a glass of wine with one of their wonderful appetizers or a salad. They have a great vegetarian entree too – Baked Portabella Mushrooms. Looking for a great deal? Join them on Tuesdays and Wednesday for “Two for $20” dinners. Tuesdays you get a two-item pizza, two salads and two glasses of wine for just $20. And Wednesdays you get to savor their Italian fare for two: 2 entrees, 2 salads, 2 glasses of wine and breadsticks… all for just $20! And don’t forget to take home a bottle (or a case) of your favorite wine. I took home some Vin de Rouge and Cellar Blush and have been enjoying them every day since :). And at just $10 a bottle! 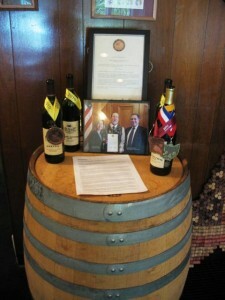 You can connect with Henke Winery on Facebook too! If you haven’t already, check out Vinoklet. It’s like being in Napa Valley but it’s right off 275! Thank you for this post! Henke is right down the street from us and I’ve always wanted to try it out. With times being as tough as they are, the 2 for $20 Tuesday and Wednesday deals sound great! And be sure to try the wine, Jodi. When I went (last summer) his “good stuff” was right around $10 a bottle (to take home). I’m sure it’s more if you buy it by the glass with dinner. Taking it home is a great cost savings option though. Have fun!